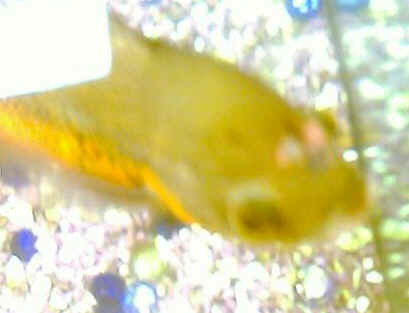 Parasites on Oscar-help needed I recently- as in a week ago- purchased a huge Oscar. say, the size of a good panfish. anyways, he had some spots on him in the pet store; they looked like scars, since he/she was kept in a ten gallon aquarium, I assumed it was from hitting the glass. I was SO wrong!!! today (the 18th) a friend was looking at her and said "are these parasites?" sure enough, she has little parasites. they look like water fleas of some sort. clear, many legged, tails. almost microscopic. They stay next to their particular 'hole' in her skin, and don't scrape off. Its scary, but I did try to scrape one off of her with my fingers (and a big glove... she's a little testy). I have a saltwater tank, and did try a very short saltwater dip. I don't know if that will hurt her long term, so it was either too short to do anything, or I didn't have high enough salinity. So, can you think of anything? the other fish in the tank is a violet goby (I know, supposed to be brackish) couple goldfish (feeders and one big one) and guppies. THEY WERE ON HER when I got her, I just didn't see them. I'm looking for name and treatment of these suckers. < You probably have fish lice. Clean the filters and do a 30% water change. Treat with fluke tabs or parasite clear. Follow the directions on the package regardless of which one you choose.-Chuck> TIA!!! - Oscar with Dirty Pores - <Hi, JasonC here...> Hi, I have a 4 year old Oscar who has developed these holes on both sides of his head. He also has a large red blotch on the front of his head, which is indented and looks like a scrap, but it isn't a scrap because it would have healed by now. He has had both of these symptom for at least two weeks. I thought he had the hole in the head disease which would explain the holes, but I don't think that would also cause the red spot. But I treated him for it anyway. I used clout last week for 3 days. Then this week I used this "Parasite clear" by "jungle" for 8 days, but it doesn't seem to be helping and the holes are getting larger and I think more are starting to form on his face. His behavior is normal. I attached 2 pictures of the marks on him which hopefully will be able to help you. So if you can tell me what you think it is and what I can do, I will appreciate it very much. Re: Ongoing Oscar Disease Problem >I did a 50 percent water change, and then a week later, a quarter tank >water change. I am continuing that schedule of water changes [my magnum is >not working as well as it should]. ><What? How long has this been going on? What other livestock affected? >What water tests have you been doing?> This is the same problem that I have had for the last few months. It just seems to have gotten really worse over the last week. After I started treatments with vitamins and stuff, it seemed to improve, then this big crash all of a sudden. I haven't done any water tests. To be frank, the expense I am running into with the vitamins, the new heaters, the other medications, along with other household expenses is stretching me thin between paychecks. <I do understand this believe me. Do look for other ways to save money (for instance cheaper pelleted foods, cut beef heart...) for your Oscars, and get test kits for pH, ammonia, nitrite, nitrate at ASAP. Stop with the treatments for Hexamita... these are quite toxic, and I strongly doubt that they are/have been doing you (or your fishes) any good> The water test kit was pricey, as was the *only* bottle of iodide I could find [it was huge]. Mind you, this is a 150 tank. I will take a sample into my fish store today and have them test it. I already have new 2 new magnums on order. >Is there any thing else I can do? I read about something called Hexamita >"Synonym Octomitus" as being one of the causes of this type of disease. >Is this true, and if so, what can I do for that? ><Hexamita (formerly of the genus Octamita) necatrix is almost for sure not the causative mechanism here... Water quality is very likely the prima facie cause. Arresting the necrosis is all-important at this point, as is "solving" by correcting the poor water quality. Again, please answer the above questions... I would be changing massive amounts of water and likely applying furan compounds. Please place any/all terms above in your search engines and study NOW and act NOW to save your livestock. Bob Fenner> Ok, I have no idea what your talking about furan compounds. I will do so on the search engine right this minute. <Very good my friend. These are anti-microbials like Nitrofurazone, as you will know. Bob Fenner> cj. Re: Ongoing Oscar Disease Problem >>above questions... I would be changing massive amounts of water and likely >>applying furan compounds. Please place any/all terms above in your search >>engines and study NOW and act NOW to save your livestock. Bob Fenner> >Ok, I have no idea what your talking about furan compounds. >I will do so on the search engine right this minute. ><Very good my friend. These are anti-microbials like Nitrofurazone, as you will know. Bob Fenner> All my searches are turning up using those words are chemical compound information texts, and chemical/pharmaceutical companies. Nothing that even relates to aquatics. <You may need to consult actual books on fish disease.> The good news is that they still eat ravenously, and there bottom fins are still out and set straight as if they were healthy... I will wait and see if you can give me anything else on the furan stuff to look for, and then will bottle some water and start another water change. What is so frustrating is that all these fish lived in a 55 gallon, over crowded, and stayed fairly healthy. A few problems with ick and aggression, and the start of the HLLE. About two months ago I pulled the money together to get the 150 tank. The HLLE was just starting when I did the tank change. <You can, will defeat this problem.... with improvement in water quality, stability of same, and use of vitamins and iodide> It just seems to keep going downhill. I used the water from the 55, I did everything as normal as I would have done if I moved them to any other tank. I have shifted tanks many times over the years. I thought the 150 would make them happy, alleviate the overcrowding, and be wonderful. And it seems that it just keeps going downhill. I have four other tanks of beautiful healthy fish, not a problem with any of them, and they are all cichlid tanks with the exception of one which is Gouramis and tetras. I am really frustrated and broke [brokenhearted] now. <Please don't give up. Persistence pays my friend. Bob Fenner, who suggests logging onto one of the cichlid chatforums for consolation and other input.> cj. Oscar and Myxosoma? <Hello!> I have searched the archives and have found very little information about this. From what I have read, I suspect that my Oscar may have this "whirling disease". He has stopped eating for the last week or so. I normally do weekly water changes of about 15%. Because of his symptoms, I have done three water changes during the last week totaling probably about 60% I have been using Melafix for the last few days , but have seen no changes. He is breathing heavy, mouth opening and closing. The other fish in the tank (2 large tinfoil barbs and a Synodontis cat) remain normal. During the day when I'm not home, I don't suspect that he is doing the whirling thing because there is no water on the floor. At night when the lights are on, he will do the quick, one full turn around action, often splashing water out of the tank. This goes on every few minutes while I'm watching. I have done some research on the web and found that infected fish will often do the whirl when they are startled or fed (connection with the lights?). Almost no info exists on this disease in Oscars, some in reference to Discus, but most are about Salmon and Trout. There are no references to a cure. 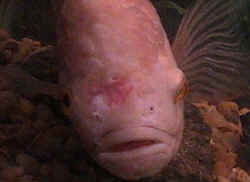 One site even said to "immediately euthanize the infected fish and all other inhabitants and sanitize the tank...there is no cure!" ...and that was a discus site! Heck, I don't think I'd get too attached to a salmon or a trout, but Oscar is family! Do you think that this is what I'm up against? Do you have any information on this and a possible cure? I hate seeing this graceful creature suffer like this. <I am sorry it took me a while to get back with you! I also had problems finding treatments for this disease. This seems to be fairly rare infection in a warm water climate. Myxobolus cerebralis is the parasite you're dealing with, and it seems to find it's host initially in Tubifex worms. I think the following course of action is in order: Quarantine the Oscar in a sanitized tank. By medicating your other fish, you're putting additional stress on their environment. 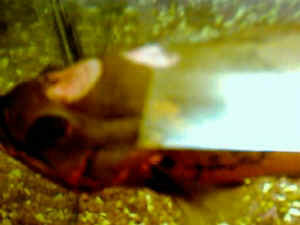 Keep his water in the QT changed as much as you can, and feed him lighter than normal. You may want to contact the nice folks at http://www.whirling-disease.org/ for more suggestions. I have a friend who is a toxicologist for the Department of Fish and Game- I'll forward your email and see if he has treatment ideas as well. Sorry I can't be of more help! Ryan> Thanks in advance for any assistance you can provide.